Conflict aggression, formerly called dominance aggression, can be a scary and difficult behavior for dog owners to manage. It occurs in puppies and often involves a dog testing the limits of who—you or the puppy—is in charge of food, treats, furniture, or toys. While it may be a challenge, if you can understand the cause, there are steps you can take to correct the behavior before it gets out of hand. What Is Conflict Aggression in Puppies? Dog owners may assume that any type of growling is a dominance aggression problem. However, there are many kinds of dog aggression, and they're categorized by the causes. Conflict aggression is one of the more common types that affect first-time puppy owners, and it may be due to a misunderstanding of canine communication. Conflict aggression includes guarding food and toys or other objects. It typically occurs when the dog believes its “place” in the family is threatened, causing it to try to put people back in line. This type of aggression very quickly gets worse if you punish the puppy. Testosterone makes dogs react more intensely, more quickly, and for a longer period of time. During adolescence, male pups have a much higher testosterone level than they do once they reach adulthood. Neutering males can cool their jets. Female dogs can act with conflict aggression too. When this happens to your pup, consult a veterinary behaviorist before having her fixed. Conflict-aggressive intact female dogs tend to get worse if they're spayed, so consider all your options. Behaviorists speculate that a first-time instinctive display of conflict aggression may arise from fear or disagreements that take place during play that gets out of control. It can also occur when a dog feels threatened near its food bowl. For instance, when snarls chase away a threat, the puppy learns to use aggression as a way to avoid or prevent a repeat of the upsetting experience. The pup can then become the first to aggress (attempt to scare off the person who might "steal my food") when faced with similar triggers. Idiopathic means that a cause for the aggression can't be identified. This type of aggression is characterized by the dog transforming from happy to threatening in a heartbeat. It may show clear signs of submission but still attacks with excessive aggression that's out of sync with the situation. Idiopathic aggression most often affects young dogs that are 1 to 3 years old and is frequently misdiagnosed as dominant aggression. Some behaviorists believe that idiopathic aggression more closely resembles status-related aggression but that the often poorly socialized aggressor misunderstands canine communication and attacks inappropriately. In such cases, pet owners must be vigilant and always supervise the dog. Manage it with muzzles, if needed, and teach the dog to “go to bed” in a crate or other safe timeout area. Drug therapy from a veterinary behaviorist may benefit the dog as well. It can be sparked by something as simple as picking the dog up or restraining it, such as for nail clipping. Reaching over the puppy near an “owned” object, like a toy or food bowl, can trigger this tendency in some puppies. While it's fine for most pups to share the sofa or bed with you, the conflict-aggressive pooch becomes possessive of furniture, guards it, and refuses to get off when told to. Furniture possessiveness only affects family members the dog feels are less in charge. That may be softer-voiced family members or young kids, but not a person with a deep, gruff voice. Sleeping in the bed with you elevates the pup’s sense of status. It's more likely to consider itself your equal—or your boss—and challenge you with growls when it doesn't like your request. Other predisposing factors include lack of training, playing tug-of-war games with the dog, and lack of exercise. Such dogs often live with teenagers in the home, have a history of a skin disorder (perhaps the discomfort aggravates a short temper), or suffered a serious illness in the first 16 weeks of life (and perhaps were babied as a result and allowed to get away with too much). These dogs may challenge the authority of young humans the way adult dogs harass adolescent puppies. Puppies and especially adolescent dogs under a year in age are most likely to be reported for conflict aggression. Ninety percent of conflict-aggressive dogs are males that develop problem behaviors by the time they reach 18 to 36 months of age, which corresponds with canine social maturity. Female conflict aggression often tends to develop during puppyhood. 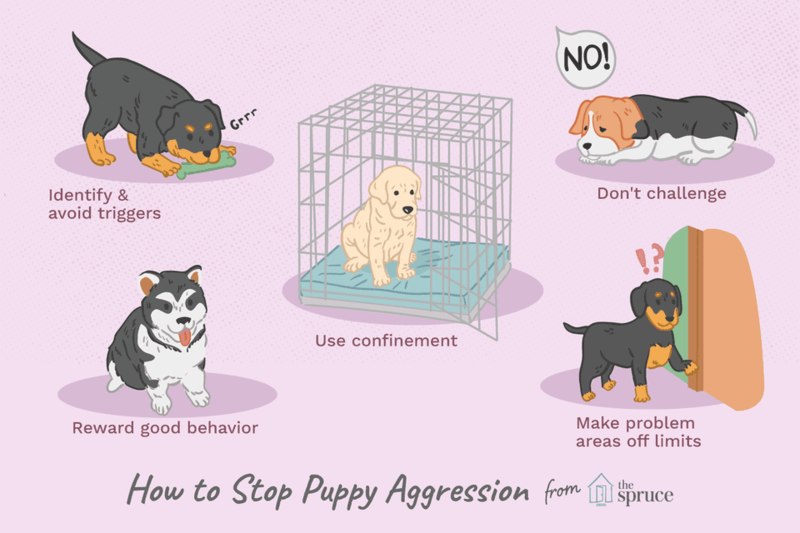 Pups that show conflict aggression often act submissive in other situations. They stay friendly or show deference to other dogs. You'll want to watch the puppy's body language for clues. Conflict-aggressive pups keep their ears and tails down during the attack (mimicking submissive signals) and tremble afterward. Owners may describe them as acting guilty or remorseful. While dog aggression cases are best dealt with by professionals, you can relieve some of the issues yourself. If your pup has excellent bite inhibition, you can begin working on this problem at home. Identify and avoid triggers to prevent confrontations. If the dog protects toys, remove them from the general environment so the puppy has nothing to guard. Don’t challenge the pup and don't punish. Avoid all casual interaction and touching. Require the pup to “earn” good stuff with good behavior. Create interactions based on your request (e.g., "Sit!") and the payment (the dog sits), which earns it the desired reward (treat/attention/verbal praise). The dog should get nothing unless it earns it by responding in a positive way to your command. When your puppy reacts around the furniture, make it off-limits. Prevent access to problem areas by placing clear plastic carpet runners nub-side up on top of sofas or beds—or simply shut the bedroom door. Use happy words or phrases to change your puppy's mood. For example, if the dog is growling or posturing, ask, “Wanna go for a walk?” and watch its mood change. It’s hard for dogs to be happy and aggressive at the same time. Confine a problem pup to a single room, an exercise pen, or a crate to better control its movements and access to trigger areas.